Tilicho lake, highest glacier lake in the world at the height of 4919m, is one of the astounding destinations of the Annapurna region. Halesi Trek Pvt.Ltd organize follows the popular Annapurna circuit and Tilicho Lake trek from Manang and continuing through Thorongla pass (5496m). Tilicho lake huge natural and religious significance. 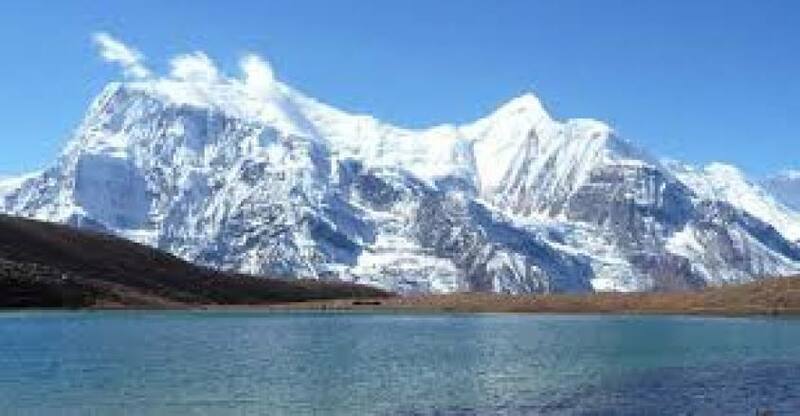 The highest lake situated at the base of Tilicho, Nilgiri, Khangsan and Muktinath peas is also mentioned in the Ramayan, one of the holy books of Hindus. With the white snowy giants all around, the tranquil bluish Lake calmly nestles offering a picturesque view for the trekkers and photographers. The Lake, fully frozen in winter, is sure to offer some incredible memories to the trekkers. 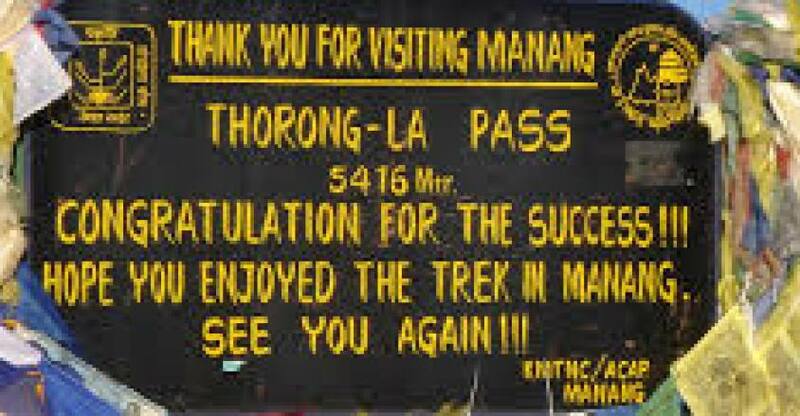 As the route follows the popular Annapurna circuit, trekking starts from drive Beshisahar walking from Chame enjoying the majestic view of Manaslu and Himalchuli, the trek leads all the way to beautiful Manang. The place is inhabited by the Thakalis whose distant culture and hospitality are very popular. Diverging from the circuit, we move along the trail to Tilicho. We stay in the Tilicho base camp where we can find accommodation facility. On our return, we head towards Thorong La pass, the highest point of the trek. On our descent, we follow through Muktinath Hindu and Buddhist temple carries a huge religious significance for Hindus and Buddhists. Day 02: Drive from Kathmandu to Chame (2670m) 9-10 hours. Day 03: Chame to Pisang (3200m). 5-6 hours. Day 04: Pisang to Manang (3540m). 4-5 hours. Day 05: Rest in Manang today is our wonderful day. Day 06: Manang to Siri Kharka (4060m). 4-5 hours. Manang. Day 07: Siri Kharka to Tilicho Base Camp (4140m). 5-6 hours. Day 08: Hike to Tilicho Lake (4,949m) and back to Siri Kharka. 5-6 hours. Day 09: Siri Kharka to Yak Kharka (4040m). 4-5 hours. Day 10: Yak Kharka to Thorong La Phedi (4,450m). 3-4 hours. Day 11: Thorong La Phedi to Muktinath (3,800m) via Thorong La pass (5,416m). 8-9 hours. Day 12: Muktinath to Kagbeni (2,810m). 4 hours. Day 13: Kagbeni to Jomsom Airport (2720m). 3-4 hours. Day 14: Fly from Jomsom to Pokhara it takes about 20 minutes. Day 15: Flight from Pokhara to Kathmandu 25 minutes. Welcome or farewell dinner typical Nepal restaurant in Kathmandu. Halesi Treks Pvt.Ltd welcomes you warmly in the Tribhuvan International Airport and transfers to hotel. Overnight at Hotel. We drive the scenarios include the River, terraced rice fields, jungles and traditional villages. First, we drive along the Trishuli River and then we follow the Marshyangdi River. In the past, the trek used to start from Besisahar, and now it starts from Jagat, Bagarchap, and Chame due to the road expansion. We cross the forested trail and landslide route. Overnight at guesthouse. The trail goes through the forest and dramatic landscape, rocky hills and the views of the local vegetation area. We move near and near to the Himalayas surrounding areas. Crossing the suspension bridge, the Dhikur Pokhari and walking through the peaceful forest to Pisang village, overnight at guesthouse. Descending to the broad forested valley floor follows the trial through the flat valley, passes a small stool airstrip, undo Braga. This is a village of about 200 houses stacked on top. From here it is only a short walk to Manang. Overnight at guesthouse. We take rest for acclimatization and explore the Manang village and around sightseeing Ganga purna Lake and views points. Overnight at guesthouse. we will head out through the western gates and follow the path down to the river. Crossing the river, we will continue walking on its southern side through coniferous forests. After reaching the Kangsar Village, we will walk further up towards Siri Kharka and pass a monastery on the way. The uphill walk could be tiring but we will have the Gungang purna Himal and Mount Chulu east, west great views. Overnight at Guesthouse. While the path from Siri Kharka to Tilicho Base Camp isn’t very steep or physically strenuous, it could be exhausting as we will have to walk on narrow paths in a loose screen and landslide-prone area. Our trail goes through the middle of the landslide area where we can see impressive rock formations along the trail. Overnight at guesthouse. After the initial tough ascent, our trail continues to pester along the side of the mountain in a gradual steep incline before reaching the watershed. On the way, we can enjoy yaks and deer grazing along our trail. On the other side is the Tilicho Lake, a large spectacular lake nestled at the foot of the north face of the Tilicho Peak. 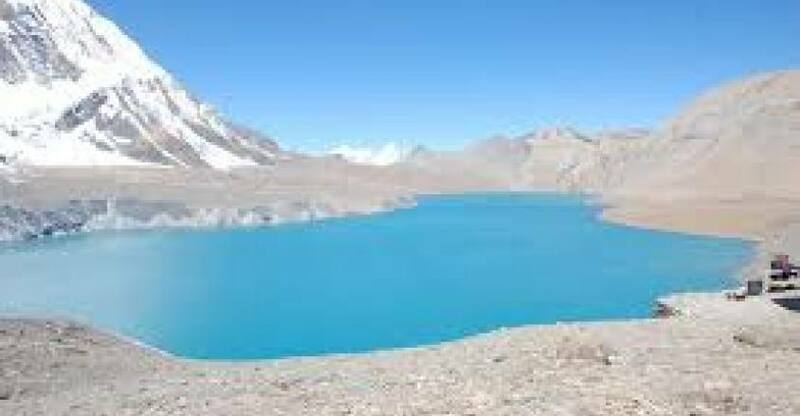 Tilicho Lake is Highest Glacier Lake in the world. After spending some time at the lake, we will retrace our step and return back to Siri Kharka. Overnight at Guesthouse. We will leave Siri Kharka and descend towards the Khangsar Village today. Following a rock wall out of Khangsar, we will walk further until we reach a seasonal bridge in the Thorang Khola valley. After crossing the river, we will ascend for a while to a plateau. Next, we will be walking until we reach Yak Kharka. Overnight at Guesthouse. After a two-hour ascent, the trail descends to cross the river at 4,310m. We then climb up to Thorong La Phedi at 4,450m. where decent guesthouses have been built in the recent years. Overnight at a guesthouse. Today is a long trek starting before sunrise at 4 am to reach the pass by 9-10am otherwise weather conditions (strong winds) will greatly affect the journey, particularly at the Thorung La Pass (5,416m). We climb steeply on a regular route which is quite easy to follow. However, some problems may arise due to the altitude and snow. It often causes terrible problems to cross the pass if it is covered by heavy snow. About four hours climb up to the pass marked by the chortens and prayer flags will reward you with stunning views from the top of the pass. Another four hours of walking will take you to the holy town of Muktinath. Muktinath means place of Nirvana and is home to the Muktinath temple as well as several monasteries. It is said that all sorrows you feel are relieved when visiting the Temple, which is a sacred pilgrimage site for both Hindus and Buddhists. The prime pilgrimage month is September. The Temple is dedicated to Lord Vishnu and has 108 waterspouts around it. Another attraction nearby is the Jwala Mai Temple which has a gorgeous natural spring and an eternal flame fueled by natural gas. Overnight at a guesthouse. After the breakfast, our trek start to Kagbeni and Kagbeni is a unique famous village of Baarah Gaun (lit. twelve villages) region in Mustang district. It lies in the popular Annapurna Circuit route and is a gateway to Upper Mustang trekking. It is a fascinating medieval village with closely packed mud-brick houses, dark alleys and imposing Chhortens. The village stands in a little green oasis dominated by its red monastery. The "Kag" of "Kagbeni" used to be "Ghag" meaning center and hence, is a center of nearby villages of Jomsom to south and Muktinath to the east. "Beni" in Nepali means confluence of two rivers, and indeed Kagbeni lies on the banks of the confluence of Kali Gandaki and Jhong Rivers. The village maintains the characteristic appearance of a fortress town and is culturally very rich. The town played a very significant role during "Salt Trade" era that flourished between Tibet and Nepal. However, with the formation of Mustang in the 15th century, Kagbeni's importance diminished. The main ethnic group in a village is Bhotias (posses last name Gurung and Thakuri). Overnight at a guesthouse. The trail passes through Kali Gandaki banks and much of the journey is windy. Jomsom is a district headquarters of Mustang and is the major settlement of Thakali people. Jomsom is a moderate town with facilities such as banks, post office, schools etc. Overnight at a guesthouse. During the flight, you will enjoy the views of Annapurna, Dhaulagiri, Nilgiri etc. You will arrive Pokhara lunch time and rest of day you can explore the pokhara valley. Overnight at hotel. After the breakfast flight back to Kathmandu and afternoon you can rest or shop in Kathmandu. Overnight at Hotel. The flight back to your home. Your safety during the trekking is of paramount concern while traveling with Halesi Treks and that turbulent and cloudy weather is regular phenomenon along the Himalayas ranges and possibility of domestic flights from Jomsom to Pokhara may have to be delayed for few hours or even canceled for a day. Any Weather conditions and health condition of a group member, or unexpected natural disasters, etc., can all contribute to changes in the tentative itinerary. Halesi Treks Guide/ leader will try to ensure your trip runs according to plan, but please be prepared to be flexible if any required. The below-given cost is per person and the below-given(Tilicho Lake Thorong La Pass and Muktinath Trekking) fixed departure dates are available for you. If the given date is not favorable then please contact us and we will happily customize your trip on dates more appropriate for you.